Compact cars from France are the most popular means of transportation in Martinique. 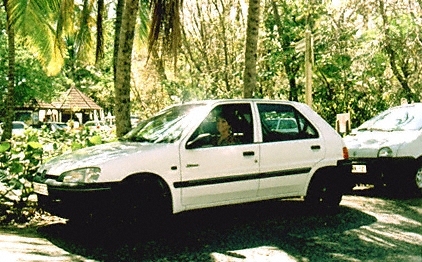 Because Martinique is a large island with many interesting sights, renting a car is perhaps the most convenient way to travel. Vehicle rentals can be arranged in advance through the international desks of major car rental companies. If your flight is scheduled to arrive after 22:00, ask your rental company if they will stay open for late night arrivals. There are also many local car rental companies and rentals are also possible through many hotels. Roads are generally good on Martinique and vehicles drive on the right. Drivers are skillful but they do tend to speed and tailgate somewhat. If you have an appointment, always allow extra time for slow moving trucks or groups of bicyclists. Traffic rules and signage are the same as in France. For stays of 20 days or less, a valid driver's license is needed. For longer stays, an international driver's permit is necessary. Bicycles, scooters and motorbikes are also an option, but given the unfamiliar terrain and the volume of traffic in Martinique, 2 wheel rentals are recommended only for the most experienced riders. Foreign driver's licenses are honored. Helmets (casques) are required. Please click here for a directory of 2 wheel rental companies. Taxi fares are generally fixed from the airport to the various hotels on the island, but you should ask and agree to them beforehand. Fares are 40% higher from 20:00-6:00 the next morning. Again, check the rate with your driver. In addition to public buses, there are more than 400 eight-passenger mini-vans bearing the letters "TC" (taxis collectifs) on the top or on their license plates. The public buses are inexpensive and often crowded. "TC" routes radiate from the Pointe Simon terminal in Fort-de-France to all the major towns. Destinations are posted in the front window or on the side of the van. They depart frequently from early morning until approximately 18:00 in the evening. The main city of Fort-de-France is linked via round-trip ferry service with the resort area of Pointe-du-Bout, operating daily from early morning until after midnight, and with Anse Mitan, Anse-a-l'Ane and Grande Anse d'Arlet from early morning until late afternoon. Arrival and departure point in Fort-de-France for all ferries (or vedettes, as they are called locally) is the Quai d'Esnambuc.